Can Sony's latest rival the best? We only got the Sony Xperia Z3+ recently, but already the Sony Xperia Z5 has been announced and with a new number there's an expectation that it will be a significant upgrade. While not everything has changed in Sony's latest the addition of a fingerprint scanner alongside an improved camera and a hefty amount of power should keep fans happy. But it is enough for the Xperia Z5 to go toe-to-toe with smartphone heavyweights like the Samsung Galaxy S6 and iPhone 6? 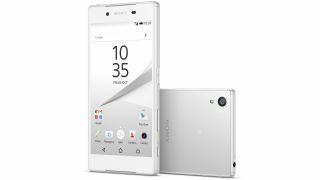 With a slim 7.3mm thick metal frame and a frosted glass back the Sony Xperia Z5 doesn't stray far from the form factor of previous Sony flagships, but the power button on the side has been slightly redesigned to incorporate a fingerprint scanner. That's a first for Sony and its set to support online payments, as well as being a speedy way to unlock the handset. Like the Xperia Z3+ the Sony Xperia Z5 is also IP68 certified dust and water resistant, with a capless microUSB port, so you don't have to fiddle with a flap every time you want to charge the phone. It's a premium if slightly overfamiliar design, finished off with a choice of either plain black or white colours or more adventurous gold or green options. Samsung completely changed things up for the Galaxy S6, but in doing so created a handset which looks a bit like a cross between the iPhone 6 and the Sony Xperia Z5. It has a sleek 6.8mm thick metal frame and a glass back, but the corners are more curved than on Sony's phone and the back isn't frosted. Like the Sony Xperia Z5 it has a fingerprint scanner, but this time below the screen and unlike Sony's handset it's not dust or water resistant. The iPhone 6 has a similarly rounded shape to the Samsung Galaxy S6 and also has a fingerprint scanner beneath the screen. It's almost as slim too at 6.9mm thick, but unlike Samsung and Sony's flagships it has a metal unibody. It's a great design, but all three handsets look distinctly premium. The Sony Xperia Z5 has a 5.2-inch 1080 x 1920 IPS display with a pixel density of 428 pixels per inch. An anti-fingerprint coating should keep it smudge-free and it's designed with good contrast and vibrant colours in mind. The Samsung Galaxy S6 might have it beat though, with its 5.1-inch 1440 x 2560 Super AMOLED screen, giving it a pixel density of 577 pixels per inch. Not only is it incredibly sharp, but it sports bright, vivid colours and good outdoor visibility. The iPhone 6 has the smallest and lowest resolution screen of the three, with a 4.7-inch 750 x 1334 display for a pixel density of 326 pixels per inch. But while it's a shame it's not sharper, the display on the iPhone 6 still offers brilliant contrast and colour reproduction. There's an octa-core Snapdragon 810 processor and 3GB of RAM at the heart of the Sony Xperia Z5. That's the same as the Xperia Z3+, but we found performance with that phone was generally smooth, so it's not too much of a worry, though the Z3+ did sometimes heat up. The Samsung Galaxy S6 has an octa-core Exynos 7420 processor plus 3GB of RAM, which also delivers silky smooth performance for the most part, though waking up the phone from sleep can noticeably take a second or two. On paper the iPhone 6 is the least powerful of the three, as it has just a dual-core Apple A8 processor and 1GB of RAM, yet as with its rivals it offers generally slick performance in day to day use. Sony has done a lot of work on its smartphone snapper, equipping the Xperia Z5 with a new 23MP sensor. Low light photography is supposedly better than it's ever been in a Sony phone, while autofocus happens in just 0.3 seconds, which Sony claims is faster than any other smartphone.